Select race to view driver finish predictions. It's been asked many times what the schedule of running (and re-running) the AccuPredict fantasy NASCAR algorithm is through the race weekend. I've tried to give you a quick glance understanding by showing the percent of metrics used in the current calculation whenever you are viewing it. Such as, "AccuPredict has 67% of required metrics for complete analysis and final driver finish positions...". By far, the biggest concern many fantasy NASCAR fans have is that because the status shows 100% complete (usually after qualifying when usually only one practice has been run) that there is still the valuable metrics of 2nd and many times 3rd practice to consider. Don't fear! I am re-running the AccuPredict algorithm after each of those practices as well. A quick rule-of-thumb is, "if you see a practices' results in the top navigation Quick Links, then I have re-run the algorithm to include it". Since four of the six metrics are historical data, once qualifying and ONE practice is in the database and used in the algorithm we TECHNICALLY have used 100% of the metrics. That is, AccuPredict has data from 100% of the metrics that it uses. If the next practice gets rained-out, we still have 100%. The formula didn't always use ALL practices. It started out as "next to last practice". So, it wasn't the first practice, but not always the last practice either that was used in the calculation. As teams began to alter their typical MO for practices, along with NASCAR rules changes for qualifying, Cliff found that his formula could be 'eeked' a tad bit more accurate by simply including ALL practice sessions...crew chiefs be damned! In fact, each off-season, Cliff fine-tunes his formula to determine if he sees ways to improve it...he is a fantasy NASCAR player at heart! Cliff's season-end analysis' have not shown including all practices to move driver predictions but very subtly. You shouldn't see any driver jump around on the table but by a fraction of a predicted rank. To finally make it official once and for all, here is the "down-and-dirty" of AccuPredict generation and re-generation each race week. I (we) know the race week doesn't always follow this pattern, but it is close enough for understanding. I complete all the results for the previous race and "move the site forward" to the upcoming race as being the "current race". I run my script to "Generate New AccuPredict". That is 4 of the 6 metrics so to let people know how far along the process is I say "AccuPredict has 67% of required metrics for complete analysis..."
NASCAR releases the entry-list and I put that in the database and re-run my script to "Generate New AccuPredict". Since there is now an entry list for the upcoming race it uses these drivers to select and run through the algorithm using the metrics that are available. (The same 4 of 6 from Monday.) The AccuPredict pages still says "AccuPredict has 67% of required metrics for complete analysis...". First practice takes place and I put that in the database and re-run my script to "Generate New AccuPredict". The script uses the drivers from the entry list. The script uses the 4 previously mentioned metrics and now includes the Rank for Practice #1. That is 5 of the 6 metrics so to let people know how far along the process is I say "AccuPredict has 83% of required metrics for complete analysis..."
Qualifying takes place and I put that in the database and re-run my script to "Generate New AccuPredict". The script uses the 5 previously mentioned metrics and now includes the Qualifying Position. That is 6 of the 6 metrics so to let people know how far along the process is I say "AccuPredict has 100% of required metrics for complete analysis..."
Practice #2 takes place and I put that in the database and re-run my script to "Generate New AccuPredict". The script uses all 6 previously mentioned metrics. Although now the Practice Rank has changed because it is combining the 2 practices. So that people know how far along the process is I continue to say "AccuPredict has 100% of required metrics for complete analysis..." Although, this 100% is a slightly modified version of Friday's 100%. Have drivers been re-shuffled in the table? Historically...very little. No one metric has so much rank that it dictates a significant move. Practice #3 takes place and I do exactly the same process detailed for Practice #2. If you are familiar with the AccuScore prediction software featured on the weekly NFL picks at ESPN, then you know the amazing reliability of its prediction success. AccuPredict NASCAR prediction is the brainchild of Cliff DeJong and brings to NASCAR driver finish predictions what AccuScore does for football. Accupredict is initially generated from the entry list then qualifying results so that all drivers in the race are ranked. I started to play in a NASCAR fantasy league several years ago. As a mathematician who has worked with statistics, it soon became an obsession for me to attempt to predict each Cup race. I began by only looking at how drivers had done in the recent past: I looked at the last six races, since that was available each week on the NASCAR site. I soon realized that there were more metrics available and useful. I restricted myself to data that was available each week and for every driver in the race. Most measures are past performance, but qualifying and practice speeds are also important. Past performance can be measured in several ways - at the same track, at similar tracks, for all races, for the last several races at the same track, etc. How to look at past races can be different: points scored, average finishing position, and, available last year, Driver Rating. All of these things are highly correlated; a driver that scores a lot of points finishes well. So, not all measures add information that can be used. I have found that NASCAR is inherently has a lot of randomness - I can explain mathematically about 55% of a driver's finish. The rest seems to be random: a crash, flat tire, speeding penalty, part failure, etc. Each off-season I spend a few weeks full time trying to add to my method, and generally with little additional improvement. The Daytona and Talladega restrictor plate races are particularly random and very difficult to predict. I have seen Jeff Gordon run up front most of the race, and then get swept up into the big one and finish in the 30's. This happens more at Daytona and Talladega than at any other race. The method that I use each week predicts the number of points to be scored by each driver. On average, I am within 20-25 points (under the pre-2011 NASCAR scoring system). If a driver is predicted to score 10 points more than another driver, then he beats that driver about 60% of the time. A 30 point difference means he is a 3-1 favorite over the other driver. The system has been successful in keeping me in the top tier of NASCAR fantasy players, but a computer-based system cannot always beat an expert. That said, this scheme performs better than any other cheat sheet that I have been able to find. Having a scheme that predicts each driver's performance has made every race more fun to watch. I care about every driver and how he does! My fantasy choices are better as well. It also tempers emotional choices, like picking Jeff Gordon to win each week, or never picking a driver that I don't like. I continually looking for ideas and welcome any thoughts or suggestions. Read or download the geeky details of the statistical method that AccuPredict uses. 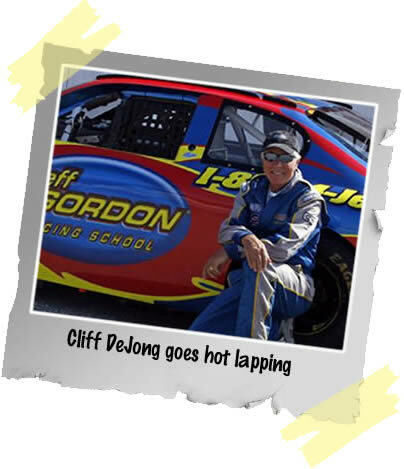 In a nutshell, AccuPredict NASCAR prediction is the brainchild of devoted NASCAR fan and truly talented, experienced and gifted statistician Cliff DeJong. Read Cliff's description of AccuPredict below the statistics table. 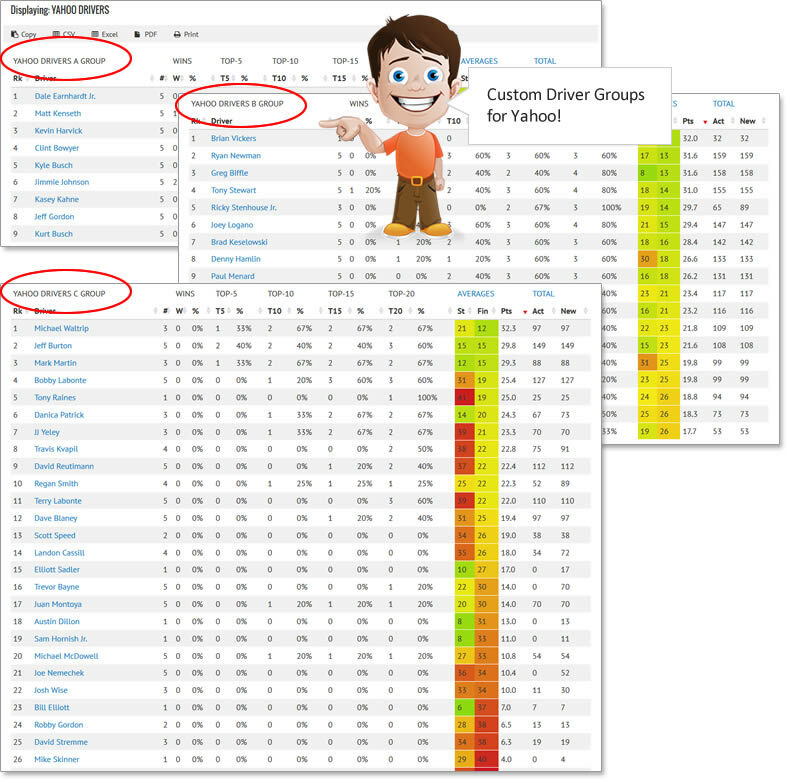 Each week the AccuPredict NASCAR prediction program will run and generate NASCAR driver rankings for the upcoming race. Since AccuPredict uses metrics that are both historical and current it this table will update as all the required metrics come available. So, initial predictions will change as the data for the new metrics is available. Predicted finish is, in essence, a composite of past average finishes in different venues. These quantities are combined to predict a driver's finish based on performance in the past. Average finish is strongly affected (and worsened) by DNFs: about 15-20% of each driver's races end with a very poor finish due to a major problem and perhaps an accident. For example, a driver that finishes 1, 2, 3, 4, and 35 (due to an accident) will average a 9th place finish, despite four really outstanding races. The best NASCAR drivers average no better than 7 or so in the long term: Tony Stewart and Carl Edwards tied for the top spot in 2011 and averaged 9 and 7.5, respectively, over the last 18 races of 2011. Average finish is however a clear way to rank drivers: no other driver did better than Tony and Carl, and they should be favored above all others at this point, based on their average finishes. The predicted finish combines this statistic with other performance measures, and is useful for ranking the drivers in a 1, 2, 3, etc manner. For the typical NASCAR race week, there will be the initial predictions table available once the previous race is official (usually Monday around noon). The AccuPredict table will update two more times on the weekend during practice and qualifying. Look for the 'Prediction Analysis Complete' status indicator at the top of the predictions table.